It isn’t hard to connect up a Pi system. If you never move your Pi, you only have to do it once. After that, you can leave everything connected. If your Pi system is ready and waiting in a big — but organized — pile, you’re ready to get it working. Start by finding a flat space on a desk with enough space for a monitor, mouse, and keyboard. You probably need more space than you think, so grab the biggest space you can find. Computers need electricity, and all the parts of a Pi system need their own power sockets. You usually need at least one, maybe more, power strips. A power strip has a plug on one end of a cable. The other end holds a plastic block with a row of power sockets. You need a strip long enough to run from a wall socket to your desk, and you also need enough sockets for all the parts. Six should be enough. Plug in and set up the power strip before you do anything else. Put the strips by the side of your desk if you can, so you don’t have to crawl around the desk with a flashlight. Here’s a weird thing about the Pi: The memory card slot is under the board. The card sticks out the side. And it’s upside down, with the pins at the top and the label at the bottom. This location makes it easy to pull it in and out, but it looks kind of ugly and fragile. 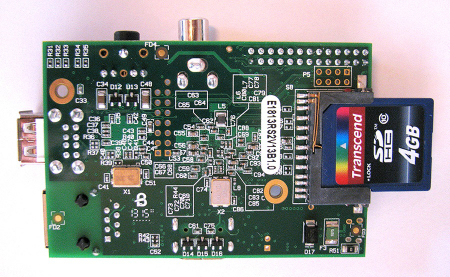 The older boards have a big card slot for a big SD card. Start with your Pi board and make sure that it’s the right way up, with all the electronics on top. The power must be off. Pick up the SD card and turn it over so you can see the metal pins at one end. Push the card with the pins first into the slot under the Pi board until it won’t go any farther. If it doesn’t go in, make sure the pins are in the right place and try again. Don’t force it! Turn over the Pi board to check you’ve done it right. There should be no space between the card and the card slot, as in shown in the following figure. You can turn the Pi board the right way up now. The card slot on the A/B models sort of half-locks, kind of. It’s easy to jiggle the card or pull it out by accident. This is very bad. Try not to move your Pi board with the power on and the software running! Don’t jiggle the card. And especially don’t power up the Pi and then put the card in, or pull it out with the power on. You’ll probably break the Pi and the memory card, and everyone will be very sad, including you. And no one wants that. To plug a card into a Model A+, B+, or Pi 2, follow the same steps for the newer Pi boards. The memory card and the slot are much smaller. This card slot works better. The card locks when you push it in so that you can’t pull it out by accident. Accidental jiggling isn’t a problem. If you need to remove the card, power down the Pi and disconnect the power. Push the card to unlock it. Now you can pull it out. To connect a monitor or TV, put the monitor or TV near the back of your desk and turn it around so that you can see the connectors on the back. The Pi end of the cable for the screen always has an HDMI connector. The other end needs either an HDMI connector or a DVI connector, depending on what kind of screen/monitor/TV you have. If your monitor has an HDMI socket — you can tell because it’s labeled HDMI — plug one end of your HDMI lead into the socket. Plug the other end into the HDMI connector on your Pi. If your monitor has a DVI socket, you need an HDMI/DVI adaptor cable. There’s one thing to know: an HDMI plug just works. You push it in, and it locks. If you push in a DVI plug, it falls out again. Always. The screws on both sides of the finger bolts behind the body of the plug have to be screwed in tight to stop the plug from falling out. 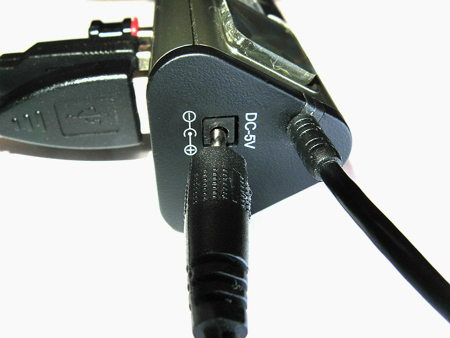 When you’re all connected up, plug the power lead into the ­monitor/TV, and plug the lead into a socket on your power strip. If you have a Model A or Model B Pi board, you need a USB hub. If you have a newer Model A+ or B+ Pi, you can skip this step because it should work fine without a hub. Hubs all have a collection of USB sockets on the top/sides, a power socket, like the one in the following figure, and a single USB plug. You should have a hub with a separate power supply. Push the USB plug into one of the USB sockets on your Pi. It doesn’t matter which one; they all do the same thing. Next, plug the power supply into your power strip. Some hubs have a fixed power cable. If you have one of these, you’re done. Others have a power socket. (There are literally about 15 different types.) Plug the power lead into the matching socket on the hub. And that’s it. Power sockets often have a label like 5V DC. Sometimes there’s a diagram showing details about the plug/socket. USB sockets don’t have this label. Sometimes they have a squiggly symbol with tiny circles and a box and an arrow. If you’re using a hub and a Model A/B, connect all USB accessories through the hub, including the keyboard, mouse, and anything else with a WiFi plug. Don’t plug anything else into the Pi! If you do, it will run out of power and stop working. Connecting a keyboard and mouse to your Pi is easy. 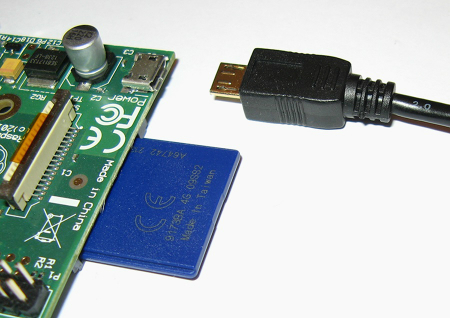 On a Model A+/B+/2, plug the flat USB connector from the keyboard into a USB socket on the Pi board. Then do the same for the mouse. With a Model B or A, plug the connectors into a hub instead, as in the previous section. Most homes have a router — a box that connects to the Internet. Most routers have at least one spare Ethernet socket. To connect your Pi to the Internet, plug your Ethernet cable into the Ethernet socket on your Pi. (It’s the big socket that isn’t a USB.) Plug the other end into the router. 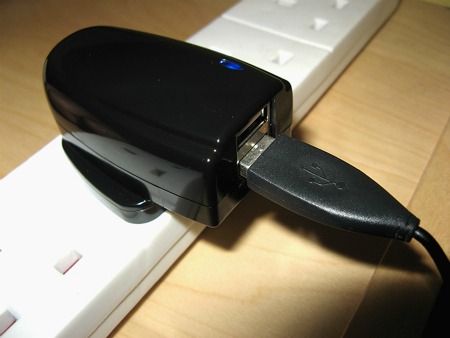 Some Pi power adaptors have one or two USB sockets. Others just have a cable running out of the adaptor. They all work more or less the same way. Plug in the adaptor. It starts working. If your adaptor has two sockets, don’t use the other socket! Your Pi wants all the power it can get. It doesn’t like sharing. The following figure shows what happens at the other end. The cable needs an extra-special tiny microUSB connector, which plugs into the microUSB socket on the Pi board. If you look at the Pi board up close, you’ll see the power socket is labeled PWR IN on the Pi 2, PWR on the A+/B+, and POWER on the A/B. The letters are really tiny, though! The microUSB socket isn’t very strong. If you keep plugging the power cable in and out, the socket breaks. It’s better to plug and unplug the adaptor from your power strip. Leave the microUSB end of the cable plugged in all the time. Another option is to get a USB socket to USB plug extender cable, leave one end permanently plugged into the adaptor, the other end plugged into the Pi, and connect the plug/socket in the middle when you want power. There’s no power switch! It was left out to make the Pi as cheap as possible and to save space on the board. You’re ready to power up your Pi. Good job! But don’t do it yet! You need to know more about setting up and powering down the Pi before you do.